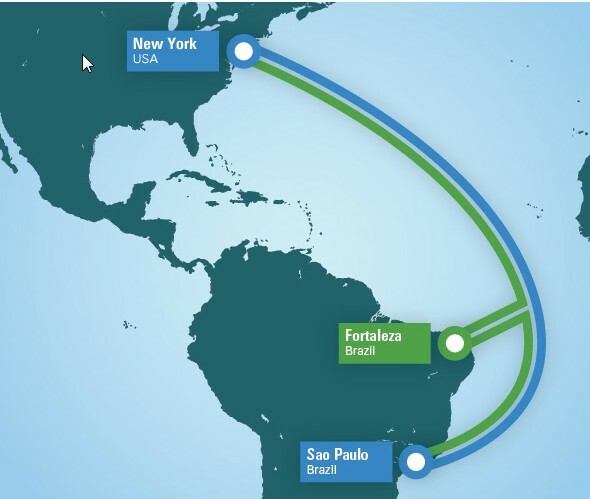 Seaborn Networks, which is preparing to build a direct link between the US and Sao Paolo, down in Brazil, has shifted its plans to a more northerly endpoint. Whereas their initial intention had been to simply land in Miami and hand bits off to terrestrial fiber from there, today they announced plans to instead offer a direct route all the way to New York City. The new landing point would allow the cable to take on GlobeNet in the low latency game between New York City and Sao Paolo. The company now projects a 104ms for POP to POP service, for instance. Given the various other projects said to be in the work to add big bandwidth to Brazil, tapping the financial vertical's demand for low latency certainly gives Seabras-1 more funding alternatives. Taking the direct route to New York would also add some diversity to the global internet infrastructure, avoiding the landing stations in hurricane-prone Florida that most bits to and from Latin America traverse. And of course it gives them close proximity to the various transatlantic cables that land in the NY metro area. Previous: Poll: Is Google Fiber the Real Deal? It should be possible from what info is already out in the public domain to work out the leading contenders for the new landing.